Juozas Milasius - guitar, PC on 6. 9. This is a rare thing: an album of guitar music where the guitar isn&apos;t really the point. Put a different way, it&apos;s the ideas that are given the focus, not the chops. There are many jazz players out there who do put the music ahead of the flash (Bill Frisell being a prime example), but hardly ever in a solo setting. With Slow, Lithuanian guitarist Juozas Milasius puts himself in the company of both Frisell and maybe Marc Ribot with this collection of 6-string (and occasional computer-aided) reveries. &apos;Jazz&apos; isn&apos;t the right word to use here and yet I hesitate to bring out the old &apos;avant-garde&apos; because its harsh connotations might frighten away the newcomers. Can I make up a new genre? Post-garde, maybe? In any event, Milasius builds some very sparse sound environments, mostly using the unadorned electric guitar aided by some reverb effects. Tones and chords are set adrift and the ideas that they spark are acted upon in very subtle ways. Taking "Icy" as an example, a single tone opens the piece followed by the chord that it&apos;s a part of. Time progresses and various extensions to the original chord float in and out as that first note hangs around acting as a pedal tone. It&apos;s like the chord is being slowly constructed and destructed at the same time. "It&apos;s Rare Air Here" is one of the tracks that brings Marc Ribot to mind. A melody is slowly played out, with its underlying support harmony kept far in the background. It&apos;s brooding and spooky and beautiful all at the same time — quite an accomplishment. And again, the lines are constructed from a minimal amount of source material. &apos;Efficient&apos; seems like a cold and inappropriate word, but it almost fits. This direction started off with the opening track "So Light," during which Milasius deploys a melodic line in the manner of Morricone (by way of Gerry Garcia circa Zabriski Point). Many of Slow&apos;s compositions are very ruminative in nature. The listener can almost feel the thought processes rumbling below the surface. 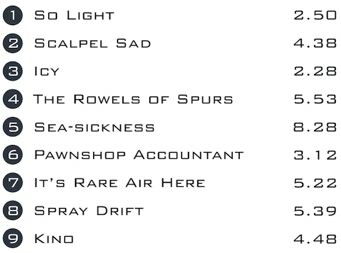 "Pawnshop Accountant" fits that model as does "Seasickness," and "Scalpel Sad" (a title I do not wish to think about). Chords produce single notes...which melt into the next chord...and on. And then there&apos;s "The Rowels of Spurs." Part deconstructed surf tune, part warped soundscape, the music tries to tell you a story while the story is perhaps falling apart. There are again echoes of Ribot and Frisell here, not so much as direct reflections but as a continuation of that new tradition of oddball musical yarn-spinning. Great stuff, even if impossible to describe; maybe even great because it&apos;s impossible to describe. Slow is indeed a rare thing: a provocative, organic, post-garde solo electric guitar record. Whatever that means.